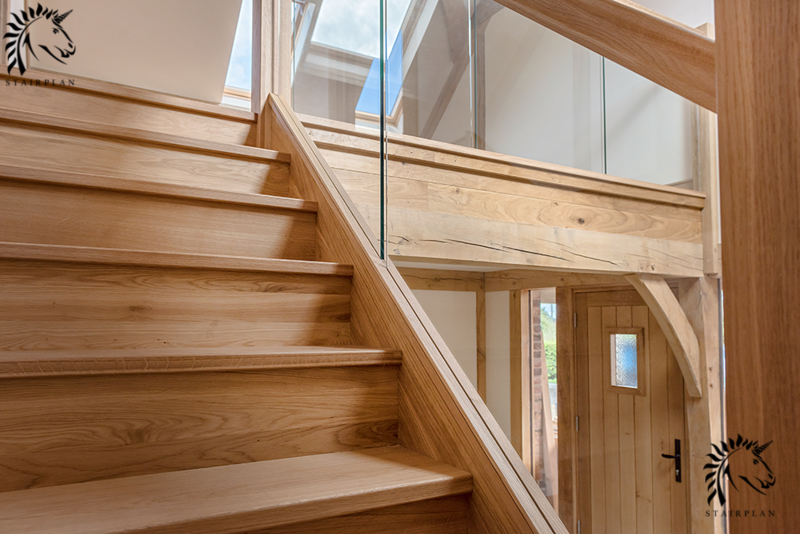 Our New Preston staircase with Vision Glass balustrade is built to a premium specification | Solid Oak Construction |. 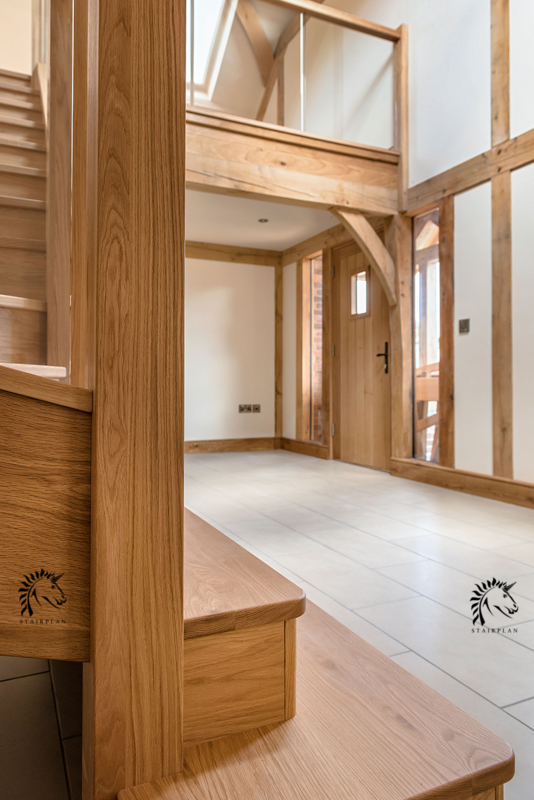 Built from Stairplan's Select Oak the Preston staircase is constructed with our heavy 32mm tread section and solid oak risers. 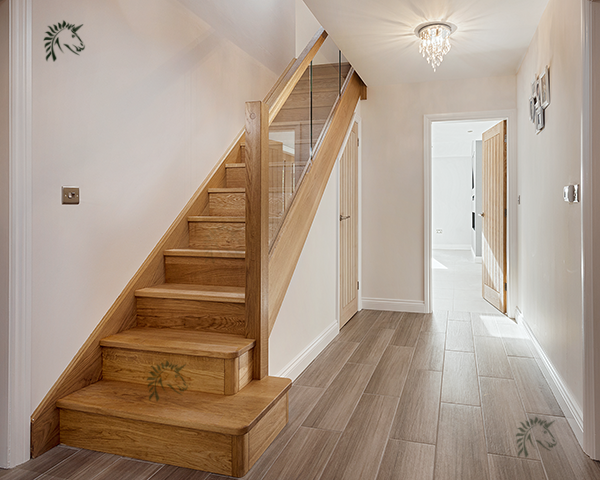 The Preston staircase is available with the either 90mm or 120mm square newel posts. 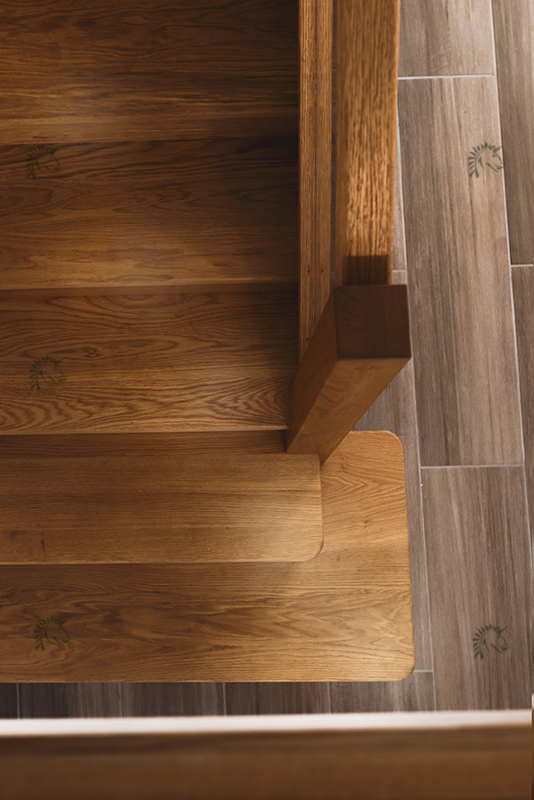 Having the 32mm tread and solid oak riser means the Preston Staircase is suitable to be left with the oak treads and risers exposed without the need for a carpet. 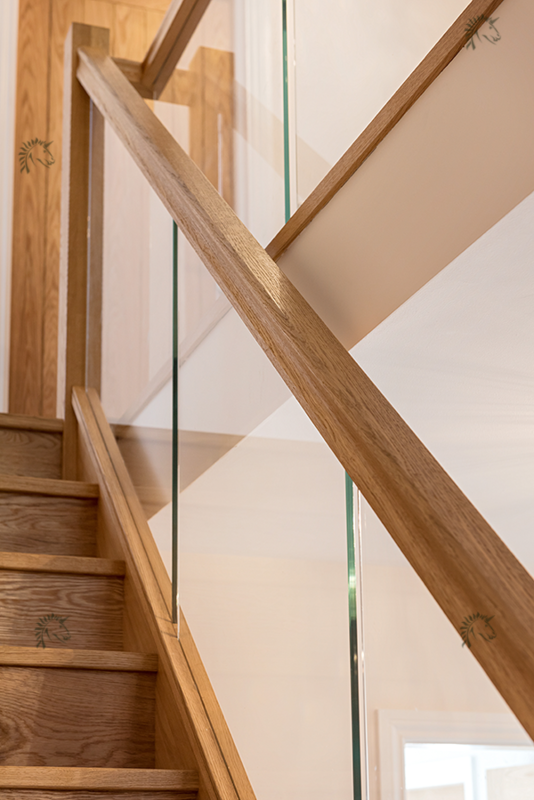 The Preston Staircase above is constructed with the 90mm sized newel posts and our 66mm Houston oak handrail profile with Recessed Vision Glass Balustrade. The bottom step is a Square Double Go Curtail step and the secondstep is a Bullnose Step. 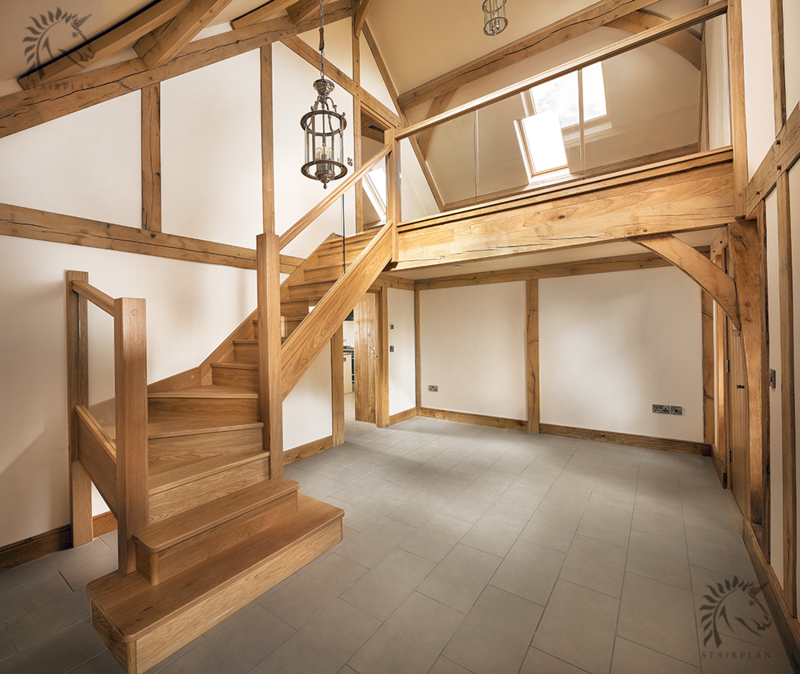 With its solid oak treads and risers the Preson staircase instantly stands out over a standard oak staircase. For anti slip we offer a structured textured finish to the tread surface as a option. 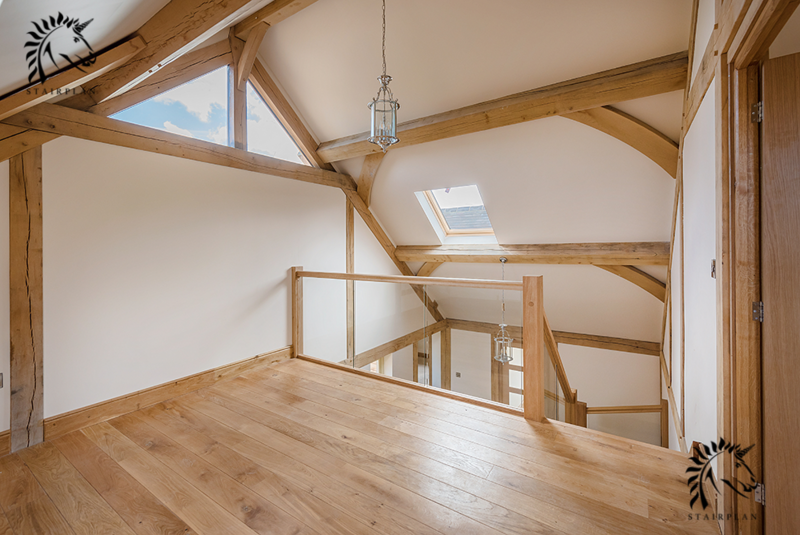 Here you can see the staircase has had a cupboard built below the staircase for storage. The Double go Square curtail step is also visible from this angle. 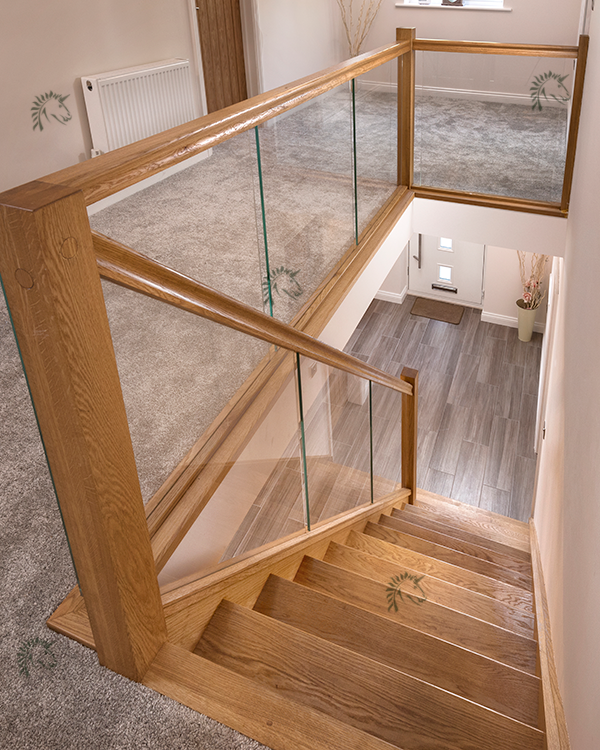 Landing balustrade is available to match the staircase, Here you can see the Vision Glass Recessed balustrade with our Houston Oak profiled handrail. By default our staircases are supplied in there raw sanded finish. on the Preston staircase we can also offer a lacquered finish as a option. Looking down onto the square oak curtail step and bullnose step. A closer look showing the heavier tread on the Preston Staircase and the recessed vision glass bsalustrade. 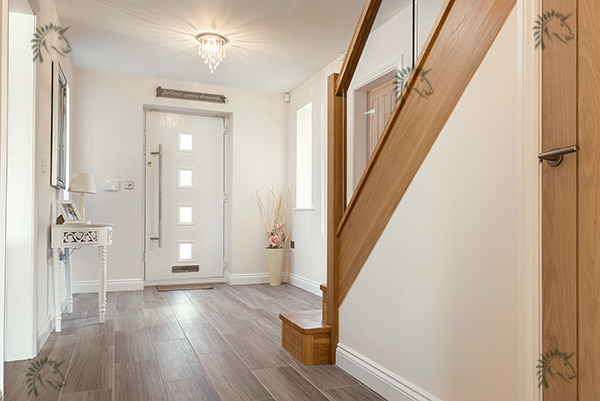 The Preston Staircase is also available with heavier 120mm newel posts and the appropriate heavier 80 x 60mm handrail section for those looking for a wider and more of a feature staircase. 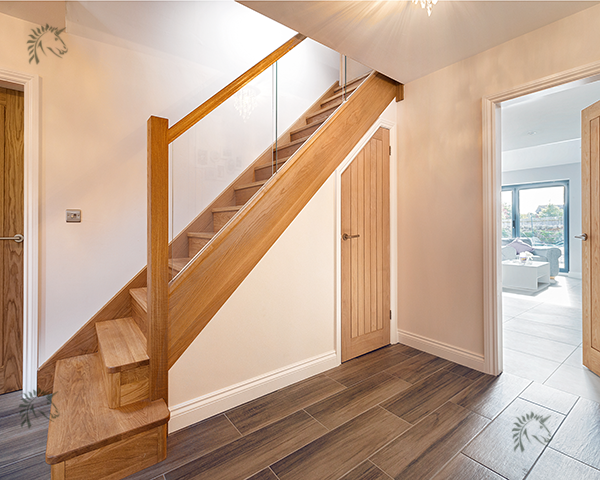 The Preston staircase can also be specified to have the main staircase constructed in a way the underside of the stair can be left exposed showing the underside of the treads and risers without the conventional unsightly wedges and glue blocks removing the need for the underside being plaster boarded. 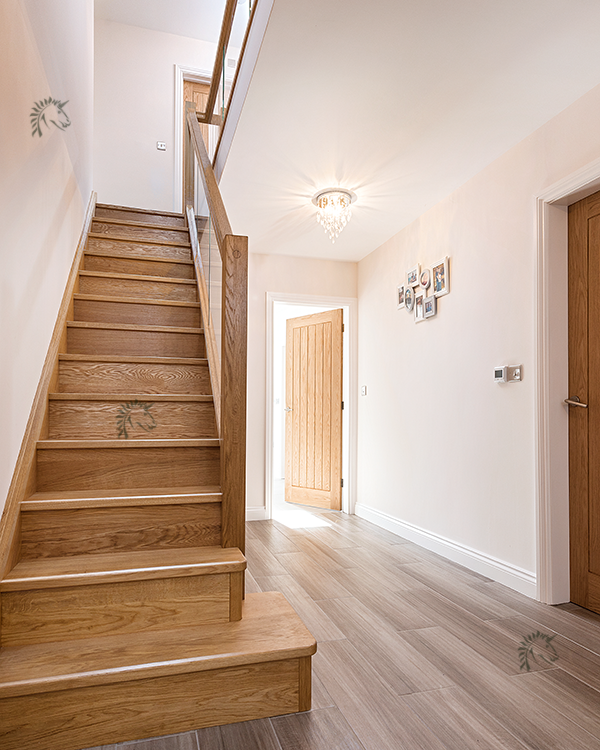 Seen here in a right hand sindle winder stair configuration., the staircase shown here also has a offside handrail on the left side, the feature entry steps shown are a double go SQ curtail entry step and a double bullnose second step. Here you can see the optional no wedge construction leaving the underside of the staircase exposed. 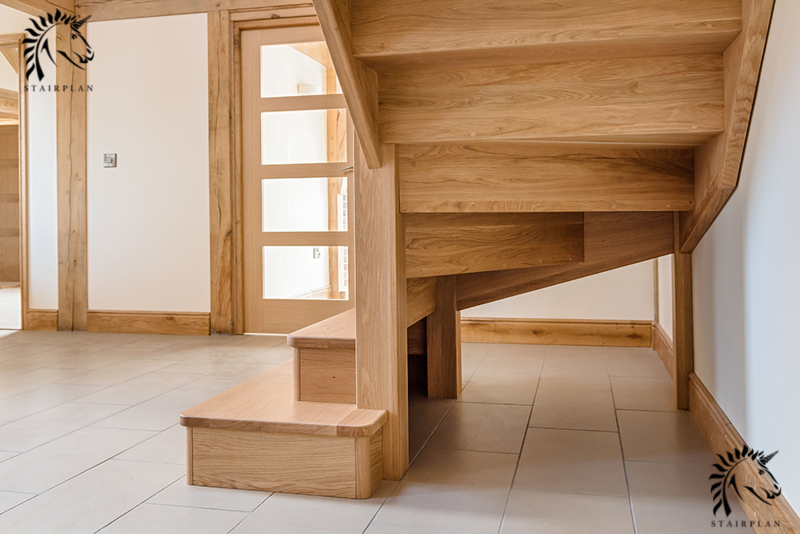 The Preston's 32mm solid oak treads and solid oak stair risers. Built to a specification for a life without the protection of a carpet runner. 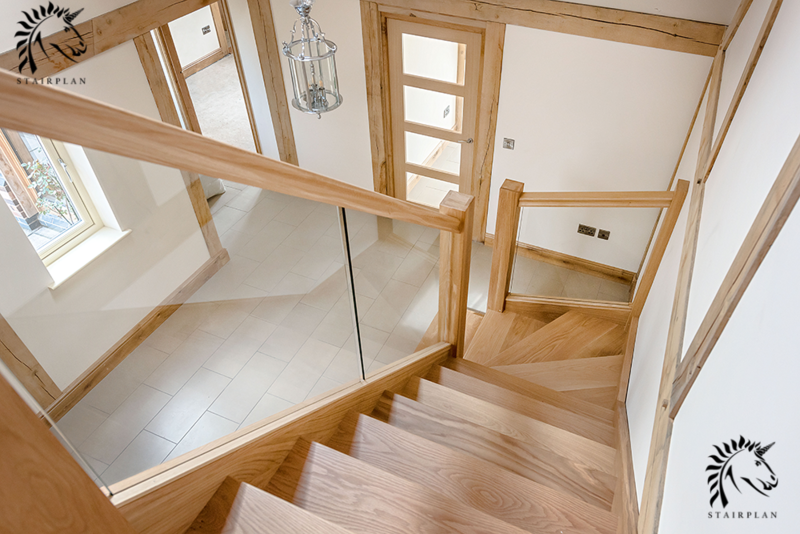 120mm Select Oak newel sections, 80 x 60mm Select Oak Handrail section grooved for the inliene style glass balustrade. 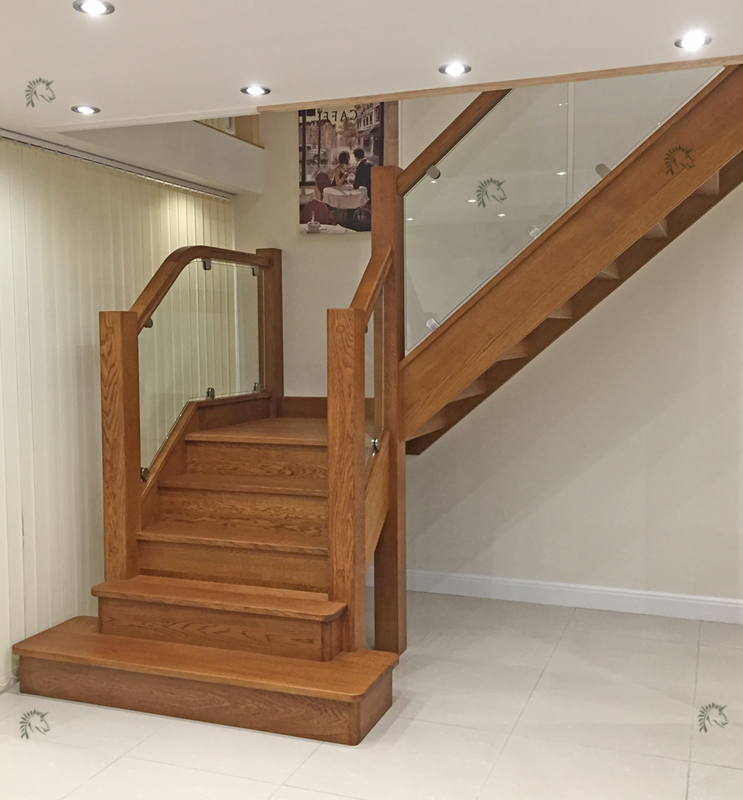 The Premium SQ Double Go Curtail and Bullnose steps with solid oak risers. Matching Landing banister railing. The Glass used is 10mm toughened safety glass. 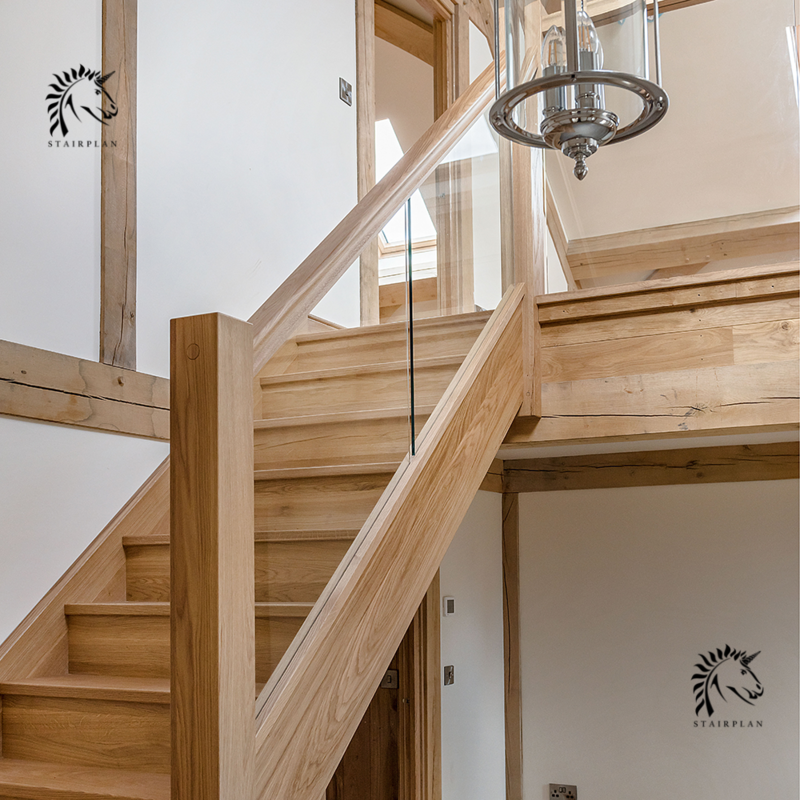 The Preston stair above is finished with a medium oak stain , the balustrade is the heavier scale we offer with the 120mm newel posts and the 80mm wide STHR ungrooved handrail. This staircase also features the "No Wedge" construction option where the underside of the staircase can be left exposed. This staircase shown here in our showroom - also featuring our new Structured Textured tread to assist with Anti-Slip. 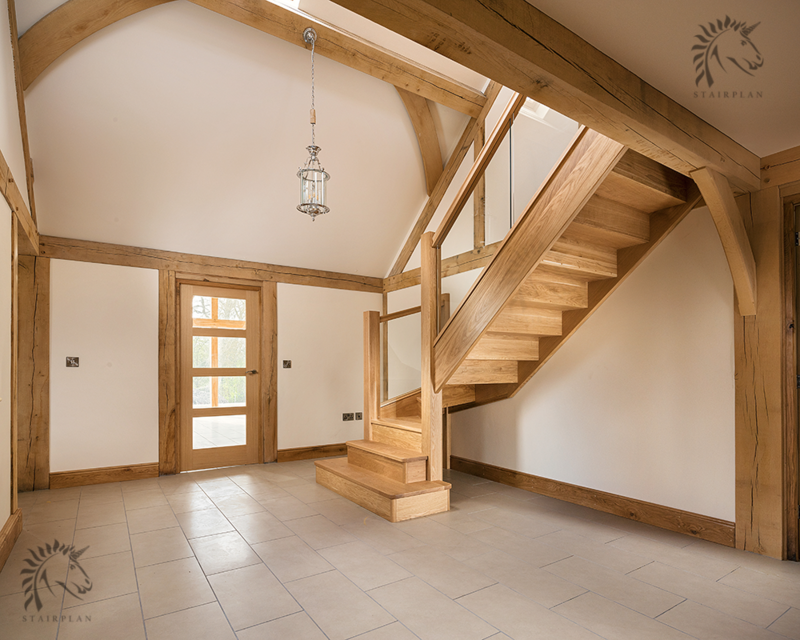 The Staircase here is currently available to purchase as Ex Display the rise the stair is made to is 2600mm.